"EK" - FOR IN-FRAME REPAIR. 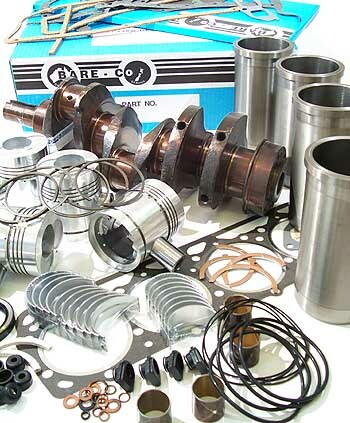 Includes - Pistons, Gudgeon Bushes, Piston Rings, Liners, Con Rod Bearings, Top & Bottom Gasket Sets. "EKM" - FOR OUT OF FRAME REBUILD. Includes ALL of the above PLUS - Main Bearings (you specify under-size required at NO EXTRA COST), Thrust Washers, Front & Rear Seals. To reduce your Inventory levels, Bare-Co lists VALVE TRAIN KITS separately below the Engine Kit Part Numbers. Valve Train Kits will fit a range of different engine kits.